----Choose one---- Get a Library Card Renew My Items Change My Pin Pay a Fine Place/View My Holds Know when my items are due and fee information? Print/Fax/Copy/Scan Book a Meeting Room Can I use my Akron card? Can I use my CLEVNET card? What does it mean when my card says it's in collections or expired? 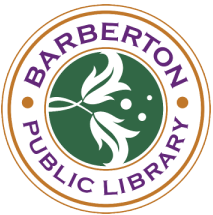 The Barberton Public Library is seeking qualified candidates for the position of Library Assistant in the Customer Services Department. The position is part-time (regularly scheduled 20 hours per week) and earns sick leave, holiday, and vacation time. The Library Assistant works a flexible schedule which will include evenings and weekends on a rotating basis. Meet local author, Kathryn Long. Kathy is originally from Barberton and lives in Uniontown with her husband, Gary. Kathy loves to write mysteries and her new book, "Buried in Sin" was released in March. Kathy will be at the Barberton Library to talk about her new book and her love of writing. Copies of Kathy's books will be available for sale and signing. Got game? Barberton Police Department does! Students in grades 3-12, find out if you can keep up with Barberton’s finest by joining us at the Barberton Public Library, in partnership with the Barberton Police Department, to play life-sized board games, video games and more. Guess what? We have pizza too! Read more about Got Game!